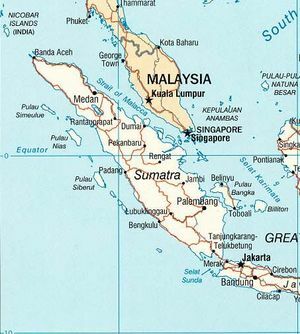 Sumatra (also spelled Sumatera) is the sixth largest island of the world (approximately 470,000 km²) and is the largest island entirely in Indonesia (two larger islands, Borneo and New Guinea, are partially in Indonesia). An ancient name for Sumatra was Swarna Dwipa, (Sanskrit for Isle of Gold), apparently based on the fact that mines in the Sumatran highlands were exporting gold from fairly early times. With its location in the India-China sea trade route, several trading towns flourished, especially in the eastern coast, and were influenced by Indian religions. The most notable of these were the Srivijaya and the Sumudra. Srivijaya was a Buddhist monarchy centered in what is now Palembang. Dominating the region through trade and conquest throughout the 7th–9th century, the kingdom helped spread the Malay culture throughout Sumatra, Malay Peninsula, and western Borneo. The empire was thalassocratic, a maritime power that extended its influence from island to island. By the late 13th century, the monarch of sumatra kingdom (now in Aceh) had converted to Islam. Ibn Battuta, who visited the kingdom during his journey, pronounced the kingdom "Sumatra", hence the name of the island. Samudra was succeeded by the powerful Aceh Sultanate, which survived to the 20th century. With the coming of the Dutch, the many Sumatran princely states gradually fell under their control. Aceh, in the north, was the major obstacle, as the Dutch were involved in the long and costly Aceh War (1870-1905). On 26 December 2004, the western coast and islands of Sumatra, particularly Aceh province, were devastated by a nearly 15 metre high tsunami following the 9.2- magnitude Indian Ocean earthquake. The death toll surpassed 170,000 in Indonesia alone, primarily in Aceh. In 2005 there was an 8.7 magnitude aftershock of the previous earthquake in December 2004. See 2005 Sumatran Earthquake. 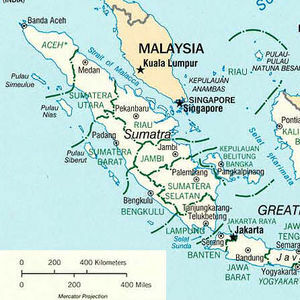 In addition to the subduction megathrust earthquake off the west coast, Sunda arc, the Great Sumatran Fault, a transform fault, runs the entire length of the island. The pressure on this fault increased dramatically after the December 2004 earthquake, and seismologists are afraid an earthquake is going to occur soon. The fault ends directly below the devastated city of Banda Aceh. The longest axis of the island runs approximately northwest - southeast, crossing the equator near the centre. The interior of the island is dominated by two geographical regions: the Barisan Mountains in the west and swampy plains in the east. The backbone of the island is the Barisan mountains chain. The volcanic activity of this region endowed the region with fertile land and beautiful sceneries, for instance around the Lake Toba. It also contains deposits of coal and gold. To the east, big rivers carry silt from the mountain, forming the vast lowland interspersed by swamps. Even if mostly unsuitable for farming, the area is currently of great economic importance for Indonesia. It produces oil from both above and below the soil— palm oil and petroleum. The island is the world's 8th highest island, although only the third highest in the Indonesian archipelago. The island is home to a host of species including: Sumatran Pine, Rafflesia arnoldii (world's largest flower), Titan arum (world's tallest flower), Sumatran Tiger, Orangutan, Sumatran Rhinoceros, Sumatran Elephant, Malayan Tapir, Malayan Sun Bear, Clouded Leopard, and many birds and butterflies. The major threats to Sumatran forest are the pulp and paper industry and expansion of palm oil plantations. The island includes more than 10 National Parks, including 3 which are listed as the Tropical Rainforest Heritage of Sumatra World Heritage Site— Gunung Leuser National Park, Kerinci Seblat National Park and Bukit Barisan Selatan National Park. Sumatra is not very densely populated, about 85 people per km²—more than 40 million people in total. It is nonetheless the fourth most populous island in the world. The most populous regions includes most of North Sumatra and central highlands in West Sumatra, while the major urban centres are Medan and Palembang. The people are of Malay stock composed of many different tribes, speaking 52 different languages. Most of these groups, however, share many similar traditions and the different tongues are closely related. Malay-speaking people dominate the eastern coast, while people in the southern and central interior speak languages related to Malay, such as the Lampung and Minangkabau people. The highland of northern Sumatra is inhabited by the Bataks, while the northernmost coast is dominated by Acehs. Ethnic Chinese minorities are also present in urban centers. A majority of people in Sumatra are Muslims (90%). Most central Bataks, meanwhile, are Protestant Christians—a religion introduced by the Dutch. The rest follow Hinduism, Buddhism, Catholicism, and Chinese traditional beliefs.